The Dominican Republic has a very stable government and economy. It is a great place for retirees, investors, and people to grow a family. It has safe neighborhoods and the houses are very affordable. So, many people think of living here. The Dominican Republic is now a very attractive place to live. The weather is great here and it offers many things to its residents. Here are the reasons why it is a wonderful place for living. The living cost is low here compared to the standard of living. With only $1200 you can live comfortably. If you buy a home then your monthly living cost will be lower. You can get a good property at a reasonable price. For example, you can get an apartment for only $100,000 or less. The price of food and grocery items is very low here. The Dominican Republic is a beautiful place. There are white sandy beaches, palm trees, and turquoise water. You will find the sunshine throughout the year. The lifestyle here is very sophisticated; it’s mostly European. There are historical structures, as well as modern shops, theaters, stadium, and museum. The people here are multicultural and very friendly. Airports have been upgraded, so it’s now very easy to travel to the Dominican Republic. There are new highways that have cut down journey hours. You can easily travel to the island because of the improved road system. Because of easy accessibility by road and air, everyday travel costs are very less now. The government of Dominican Republic now welcomes foreign retirees. All you need to do is show a monthly pension of $1500 and you can qualify for provisional residency. It has fast developed infrastructure and good tax incentives, making it a very great place to do business. Foreign investors are welcome here. You will get a 15-year exemption on all taxes and VATs if you start a business in a fee trade zone. The government here promotes tourism growth. 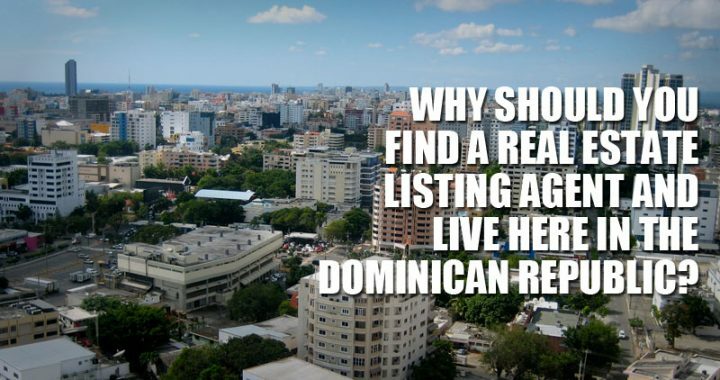 All these reasons make the Dominican Republic a great place to live. After you move here you need to find a house to live first. You can either buy a house or rent one. You should get in touch with a real estate agent to give you suggestions regarding properties. If you are thinking of moving to the Dominican Republic, then you should sell your present house before moving. You should find a real estate listing agent and get your property a listed in their database. Here are some characteristics you should consider when hiring a real estate listing agent. The agent must have many years of experience in this business. They should have a professional degree and be certified. They must have a good network; this will allow your home to be sold quickly. They should be good at communication and negotiation. The agent doesn’t know how much your property could be sold. So, avoid hiring someone who gives a guaranteed price for your house; they are actually lying. Besides keeping these things in mind, you should follow your instinct and see if you can trust the agent.